It's a slumber party! 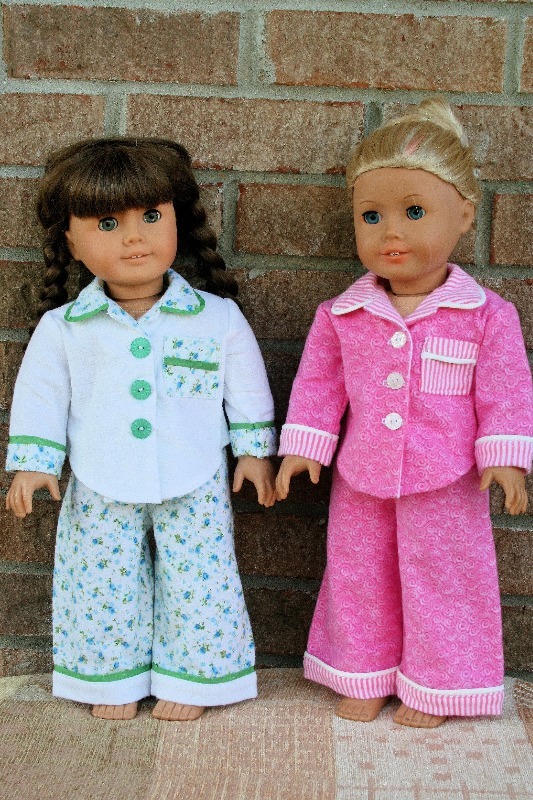 These fun pajamas are designed to fit 18" dolls such as American Girl®, but will also fit other 18" dolls. The pattern can be combined in different ways for a wide variety of looks. There are two versions of the PJ's; one for winter and one for summer. 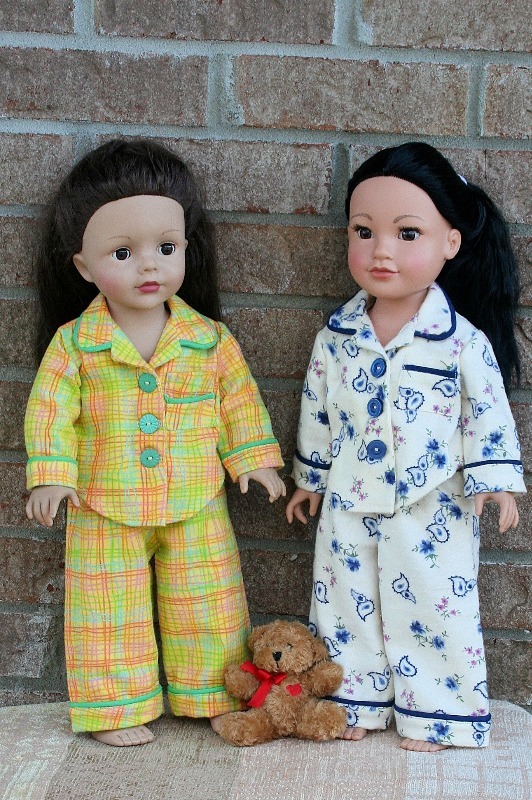 View A is a classic pajama to keep your doll warm and cozy. It can be made with two coordinating prints, accented with piping. There are cuffs on the sleeves and the pants, and the shirt has a shaped "shirt-tail" silhouette. Directions for a detailed pocket with a piping accent are also included. The long pants fit snugly with an elastic waistband, and the top closes with hook and loop tape or buttons down the front. View B is the summer version. It has a collar accented with piping, and a feminine ruffle at the hem, also accented with piping. Since it is for summer, it has short pants and short sleeves. The shorts have elastic at the top for a snug fit. The pattern pieces in this PDF pattern are drawn with a CAD program, and include highly detailed step-by-step instructions with pictures to guide you through the sewing process. Suggested Fabrics: Woven fabric such as cotton or cotton blends or flannel. Not suitable for knits. What You Get: One 25 page sewing pattern that you digitally download as a PDF file so you can start your project immediately! The PDF sewing pattern provides full color step-by-step illustrated instructions and full size pattern pieces. A PDF reader is required to view and print the files (example: Adobe Reader or Preview for MAC). The download link is received immediately after the transaction is complete. Print copies are NOT available. A well-made pattern that was easy to work with. I haven't tried the recent update that was sent to me, but it doesn't visually appear that the pattern pieces have been altered, but more modern pictures. I love this pattern! It easy to work with and the neck facing is nice and deep so it lays flat inside just like it ought to. The design gives you so many options for color combinations. They work up faster than you might think. I have made 8 pair now.